More than a billion people have a disability. And regardless of the country or community they live in, the gaps in opportunity for people with disabilities are striking: One in three people with a disability lives in poverty. 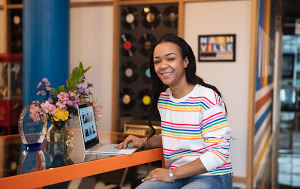 In places like the United States, 50 to 70 percent of people with disabilities are unemployed; in developing countries that number increases to 80 to 90 percent. And only 10 percent of people with disabilities in developing countries have access to the assistive devices they need. 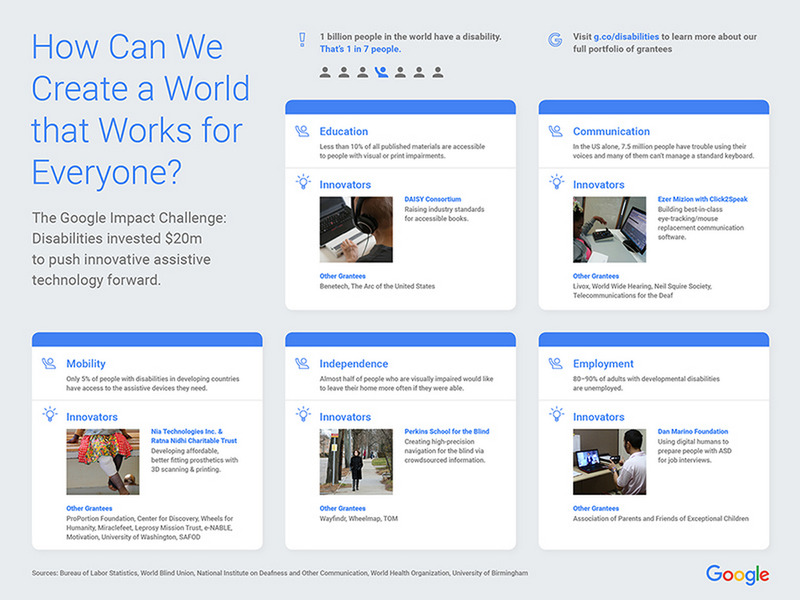 Last spring, Google.org kicked off the Google Impact Challenge: Disabilities, an open call to global nonprofits who are building transformative technologies for the billion people around the world with disabilities. We’ve been amazed by the ideas we’ve received, coming from 1,000+ organizations spanning 88 countries. We’ve shared a handful of the organizations we’re supporting already—and today we’re excited to share the full list of 30 winners. The organizations we’re supporting all have big ideas for how technology can help create new solutions, and each of their ideas has the potential to scale. Each organization has also committed to open sourcing their technology—which helps encourage and speed up innovation in a sector that has historically been siloed. Meet some of our incredible grantees below, and learn more about all 30 organizations working to improve mobility, communication, and independence for people living with disabilities at g.co/disabilities. 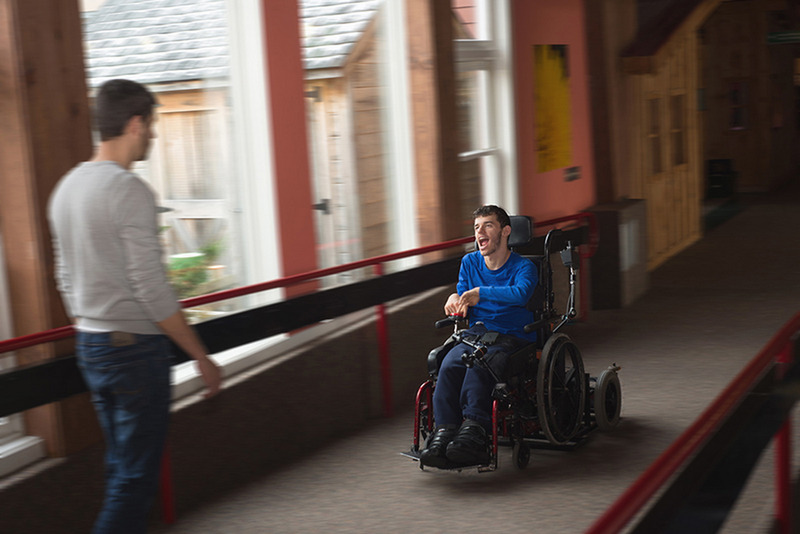 Power wheelchairs help provide greater independence to people with mobility limitations—allowing them to get around without a caregiver, or travel longer distances. But power chairs are expensive and often not covered by insurance, leaving many people limited to manual wheelchairs. With their Google.org grant, the Center for Discovery will continue developing an open source power add-on device, the indieGo, which quickly converts any manual wheelchair into a power chair. The power add-on will provide the mobility and freedom of a power chair for around one-seventh the average cost, and will allow people who mainly use a manual wheelchair to have the option of using power when they need it. The device design will be open sourced to increase its reach—potentially improving mobility for hundreds of thousands of people. A young man using the indieGo to greet friends. Turn-by-turn GPS navigation allows people with visual impairments to get around, but once they get in vicinity of their destination, they often struggle to find specific locations like bus stops or building entrances that GPS isn’t precise enough to identify. (This is often called the “last 50 feet problem.”) Lacking the detailed information they need to find specific new places, people tend to limit themselves to familiar routes, leading to a less independent lifestyle. 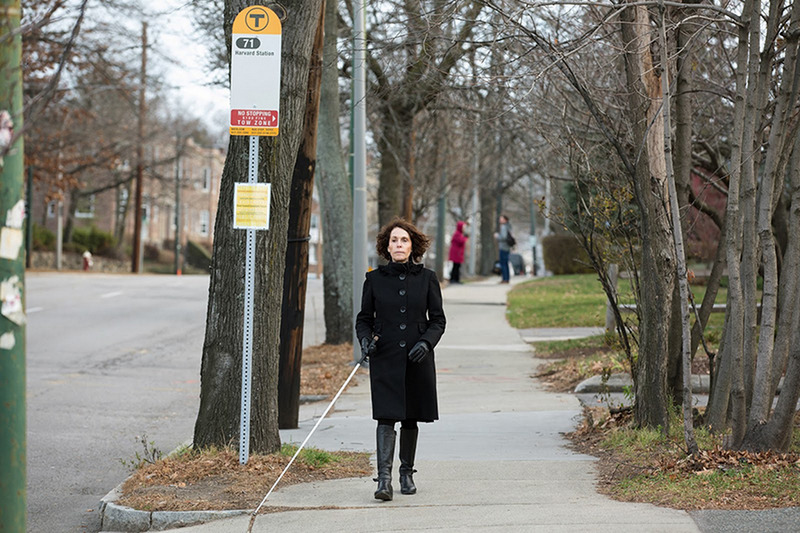 With the support of Google.org, Perkins School for the Blind is building tools to crowdsource data from people with sight to help people navigate the last 50 feet. Using an app, people will log navigation clues in a standard format, which will be used to create directions that lead vision-impaired people precisely to their intended destination. Perkins School for the Blind is collaborating with transit authorities who will provide access to transportation data and support Perkin’s mission of making public transportation accessible to everyone. Perkins School for the Blind employee, Joann Becker, travels by bus. It can be hard for people with visual impairments to locate the exact location of bus stops and other landmarks. An estimated 1 million children currently live with untreated clubfoot, a lifelong disability that often leads to isolation, limited access to education, and poverty. Clubfoot can be treated without surgery, but treatment practices are not widely used in many countries around the world. Miraclefeet partners with local healthcare providers to increase access to proper treatment for children born with clubfoot. They will use Google.org support to offer support to families via SMS, monitor patient progress through updated software, and provide extensive online training to local clinicians. To date, Miraclefeet has helped facilitate treatment for more than 13,000 children in 13 different countries; this effort will help them significantly scale up their work to reach thousands more. Miraclefeet helps partners use a simple, affordable brace as part of the clubfoot treatment. 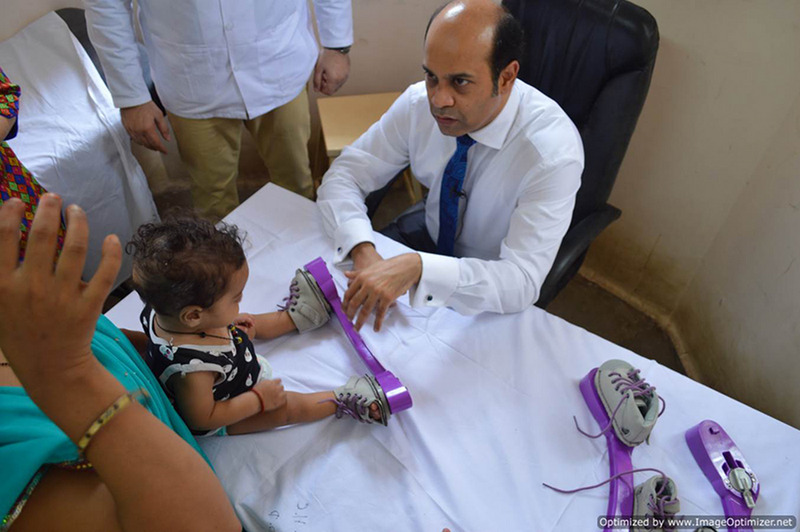 Here, a doctor in India shows a mother how to use the miraclefeet brace. 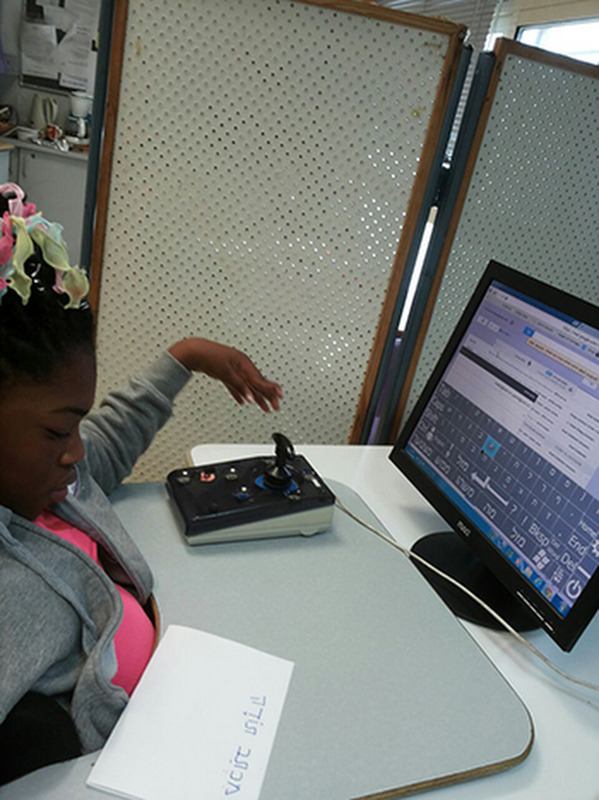 A young girl learns to use the Click2Speak on-screen keyboard with a joystick controller. People with high cognitive function but impaired motor skills often have a hard time communicating—both speaking or using standard keyboards to type. 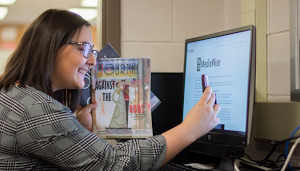 Augmentative and alternative communication devices (AAC) help people more easily communicate, but are often unaffordable and restricted to specific platforms or inputs. Without an AAC, people may have difficulty maintaining personal relationships and professional productivity. Ezer Mizion is working with Click2Speak to build an affordable, flexible, and customizable on-screen keyboard that allows people to type without use of their hands. With the grant from Google.org, Ezer Mizion and Click2Speak will gather more user feedback to improve the technology, including support for additional languages, operating systems, and different devices like switches, joysticks, or eye-tracking devices. From employment to education, communication to mobility, each of our grantees is pushing innovation for people with disabilities forward. In addition to these grants, we’re always working to make our own technology more accessible, and yesterday we shared some of the latest on this front, including voice typing in Google Docs and a new tool that helps Android developers build more accessible apps. With all these efforts, our aim to create a world that works for everyone.